and a website from Rocky Chiocchi. Merry Christmas - corpsdially yours from jo! Hopefully, for those of you celebrating Christmas this year, you're more ready than I am. Either way, enjoy this entry from last Christmas Eve, and know I love and miss you all! Heard a horn before Christmas, still asleep in our house. “Jo, get to the Annex, with no time to spare. They’re letting us march again, and I know that you care. My only reaction was, “Mouse, is this crap? “Jo, just listen to all of us making a clatter. The cops are here now to find out what’s the matter. The cadet blue and gold finished off with a sash. Since we left that stuff behind long, long ago. Saints one and all, our family so dear. And Peaches, and Pebbles, and Goober, and Mick. But we put the word out, and by hundreds they came. We’ll top all the captions, and walk away with it all. When it was that we aged out, once and for all. The pain in my head – thought I’d poked out my eye. To march again at this age? Should I give it a try? Cups of tea, of course (what, did you think I meant brew?). Rifles holding their mouths ‘cause each knocked out a tooth! Each face looked so young, an image to astound. Was I the only one here who’s age didn’t turn around? Wait a minute now! The trick must be in the boot! So I struggled and struggled to stick in my foot. Someone inside the hall yelled, “Everyone, back! It’s time to stop practicing – we all have to pack. The jacket and skirt didn’t cover my belly. As they each grabbed their shakos from up on the shelf. Wait! Who was that there, just a bit up ahead? He stood with the drum line, his life’s love and work. And Ralph, Tony, Frank, and ...” Then, I just froze. What a dream I was having, what a wish I was making. The time of my life was just there for the taking. I awoke Christmas Eve, just a bit after seven. My dream was a gift that came straight from heaven. And we talk with each other ‘til our faces turn blue. Still, what can I get you, with Christmas tomorrow? Lots of love, luck, happiness, and no trace of sorrow! As the New Year unfolds – wishing you a great life! With love to you all – corpsdially yours from jo! We spent a lot of Christmas holidays together ... parades in Metuchen and Woodbridge, our annual parties in the Annex (including receiving our 5-year medals), singing Christmas carols on the way to color guard / ensemble shows (Althea, still remember the alto parts? ), Mrs. Antol's Saints cakes, visiting each other's houses, and the like. My favorite memory? Hands-down, it has to be the warm-to-the-touch Christmas tree procured each year under questionable circumstances ... and then donated to the nuns in the convent when we were finished with it. If there's anyone out there NOT in the witness protection program who's able to fill in more details, I'd love to run the full story. So, what's your favorite Saints family holiday memory? Send it along to joparente.saintsdrumcorps@gmail.com. All for now - corpsdially yours from jo! PS - Jackie and Peaches, thanks for sending in those trivia questions. We'll pick up Tuesday Trivia again after the holidays. First, on the last Trivia - the short answer is yes, it was Legionnaires Disease (thanks to all who responded). Just an hour after I made the post, things got a bit crazy with family illnesses, and then, there was an actual outbreak of Legionnaires at St Peter's Hospital in New Brunswick. I am not sure if I am contacting the right person, but I wanted to inform you that my mother Doreen Derlak (Lang) passed away on May 31, 2008 from Cancer. I just wanted to update you. I know that the drum corps were a very important part of her life. I hate to ask this, but do you know if there are any pictures of her on the website? I would love to see them. OR do you happen to know of anyone that would have any? Jenifer's contact information will be posted on the site, but in the meantime, here's the challenge. I KNOW that the loyal Scribblings readers are just looking for some reason / excuse to spend time out on the site, and here it is. 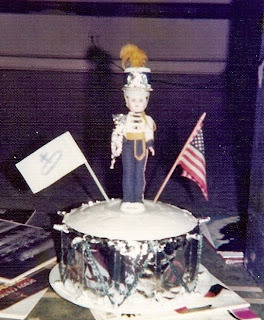 I promised Jenifer that I would ask you all to go on a Scavenger Hunt for her, searching our photo galleries on www.saintsdrumcorps.com (and private photo collections you may not have sent in for Rocky to post) for pictures of Doreen. As you find them, go ahead and post your discoveries out in the Guest Book. Make sure you're as specific as you can be by including the Gallery Number, Page Number, Row, photo number for that row, and which person is Doreen. For example, if I were identifying a picture of Dawn Fair, recent 50th Birthday celebrante, here's how it would go - Gallery 2, Page 1, Row 1, Picture 5, person on the right. This would be a great Christmas present and tribute to Doreen - I'll reward you with the 12 Days of Christmas, Saints-Style, that I never finished posting last year. Promise.